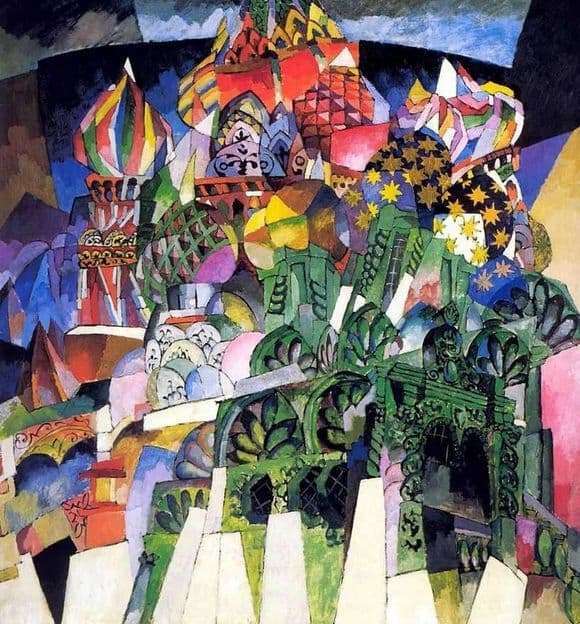 Lentulov in his time was affectionately called the Russian futurist, and in many ways this was fair. His works, which go beyond the framework of the paintings, are characterized by strong dynamics and problems incomprehensible to the general public, bore all the imprints of futurism to be considered as belonging to this movement. However, if futurists, as a rule, turned to the future – to industrial cities, growing beyond their own limits, stretching upwards and worn out by a combination of faces that were incredible according to the laws of perspective – then Lentunov, on the contrary, turned to the past. His paintings combined seemingly incompatible – gray antiquity of Russian classical architecture, ancient buildings that survived the centuries and the new-fashioned trend of the artistic style in which everything was mixed and turned upside down. “St. Vasily” depicts not just the eponymous cathedral, although its domes (even brighter than in life) are undoubtedly present in the picture, but as if all of Moscow with its Old Arbat, Red Square, Garden Ring. Several centuries of the life of a huge city fit into the picture frame. The perspective is disturbed in it, the color solutions seem incredibly bright and therefore somewhat clumsy. Most of all, it resembles the pattern that can be seen by looking into a kaleidoscope – here it is, bright, beautiful, festive – but if you just slightly shake the phone, it will crumble and re-form. In the case of the picture, you expect that St. Isaac’s Cathedral from St. Petersburg or the Savior-on-the-Blood from Yekaterinburg will suddenly appear on it. That another city will appear in it – it will appear and also stand out from the picture, showing it is impossible, not in the way it could be seen from the point of view of the viewer, but as if enveloping itself and concluding in itself. Impossible dynamics leaves such an impression – a closed, frozen motion, which at any instant is ready to turn further.